Route Taken For This Trip: Banjara Hills, Hyderabad - Gachibowli ORR Entrance - Nalgonda - Kondamodu - Ongole - Guntur - Puducherry, it was roughly a 14 hours long drive, ranging around 800 km. Alternate Route That Can Be Followed: Banjara Hills - Mahbubnagar - Kurnool - Nandyal - Kadapa - Rayacholy - Chittoor - Kanchipuram - Puducherry (14 hours, 777 km approx). Toll Plazas From Hyderabad To Pondicherry: On my way to Puducherry, I encountered 12 toll plazas. For further details on the toll Plaza, CLICK HERE. Ever since I saw Yann Martel's "Life of Pi", I was so fascinated with the beauty of Puducherry. Each scene in the movie, which captured the beautiful locales, felt like an ode to the Union Territory. Like most people, even I had a travel Bucket list, and Puducherry definitely featured on top of my list. What started as a simple getaway from Banjara hills in Hyderabad, paved way for the biggest adventure of my life, a road trip, that too to the land of my dreams "Pondi" (as it is fondly called). It sure felt like a page out of some Bollywood film. Situated on the edge of The Bay of Bengal, "The Indian Cote d'Azur" or "The Riviera of the East" is a sight to behold. The sophisticated yet comforting and calming vibe that this place exudes is something to die for. It is an enchanting melange of both the French and the Indian cultures. The lush-green boulevards, the ever-so-delightful bougainvillea (hanging from the colonial-style houses), the Rues (French for street) magically merging into the Tamil quarter, the dynamism, the spiritual abundance, the splendid amalgam of the French and Indian cuisines, the serenity of the "Ville Blanche or White Town" mixed with the hustle bustle of its boisterous and noisy Tamil counterpart (Ville Noire or Black Town), make India's "Little France" a must-visit place for all the travel aficionados. Eateries On The Way To Beat The Hunger Pangs: No road trip is complete without giving the lip-smacking food served in the hotels alongside the road a try. The entire stretch was peppered with gastronomical treats. Few tastes that remain fresh on my palette are from places like: Sri Manikanta and Pujitha Restaurant on NH 65, Reliance A1 Plaza, Blue Moon Family Dhaba, Ulavapadu Biryani and Nakshatra Hotel, they offered a decent and delectable fare at affordable rates. DAY 1: Managed to make it to Pondi, well before Sunset, exactly how I'd wished for. The moment I reached the place, I checked into the Promenade Hotel, the view of the Promenade beach from the hotel was breath-taking, the excellent location of the hotel situated on the Promenade beach, mouth-watering delicacies and the courteous staff were the major pros. The fact that it was in the middle of the white town made it even more endearing. A leisurely walk on the sidewalks of "The Goubert Avenue" or the Promenade beach was an overwhelming experience. The statue of Mahatma Gandhi, which acted like a general reminder of the fact that I was still in India, managed to invoke a patriotic feel in me. Sitting on the mile-long stretch sipping hot tea and watching the waters gush by and hit the rocks was a sight in itself. The sea breeze gently caressed me and put me to sleep, a good night's sleep. DAY 2: on Day 2, I set out for Auroville, which was at a distance of 12 km from my hotel. 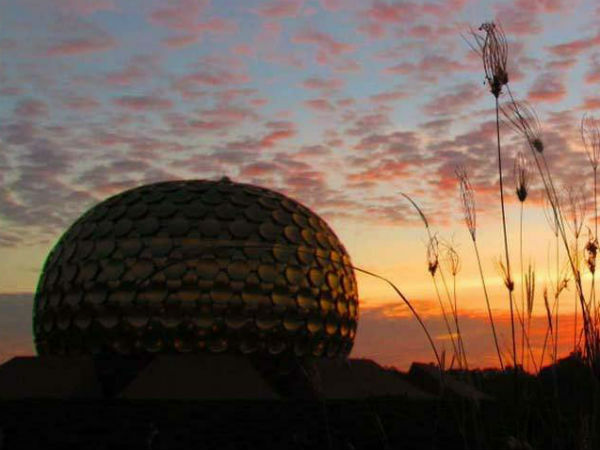 The moment I set sight on Auroville, it felt as if I had attained my life's purpose, the feeling that I underwent was inexplicable. It is an experimental township founded by "The Mother", who was a disciple of the revered Sri Aurobindo. In Auroville, people from all walks of life live together under one roof, free from the shackles of boundaries and narrow domestic walls, which belittle the concept of borderless living and harmonious co-existence. It is also known as the "City of Dawn". After visiting the Auroville, I headed to the popular Paradise beach, the name was a perfect justification of the beach, it was indeed a paradise on earth, it was easily accessible by ferry. The boat ride overlooking the backwaters was marvellous, the beach was serene and clean. A 30-minute boat ride from the Chunnambar Boat House costed me around INR 200. It is advisable to carry one's own food stock because there is hardly any eating joint on the beach, except a small restaurant which is costly as well as crowded. This beach is a treat for all beach lovers because of the availability of changing rooms and showers. After this, I headed back to my hotel. I must say, it was quite difficult waking up the next day, as my heart didn't want to leave this place. Nevertheless, I bid Pondi adieus and set out on my journey back home.